Thanks man. I feel your pain, I was doing something similar for a long time. This seat really makes a huge difference. I can play Forza for....way too many hours at a time... and my back/bum won't be aching. I've mostly just been playing with this for the last year and a half or so. 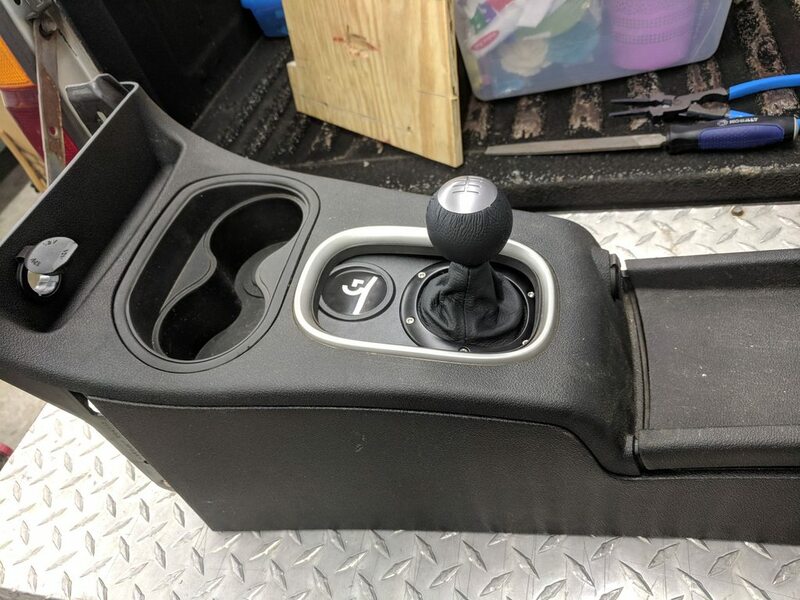 While buying a new center console for my truck (Frontier console with cupholders) I was mistakenly sent a 2009 Pontiac G5 console instead. 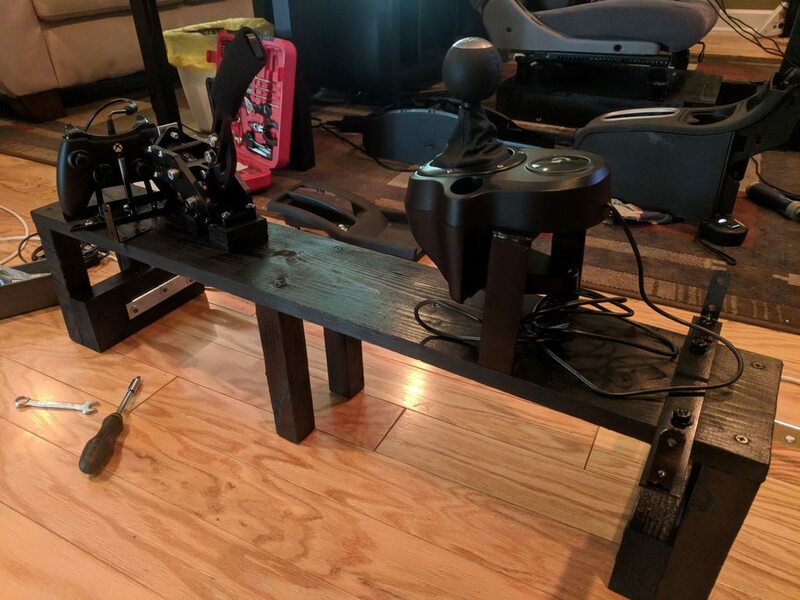 The order has since been corrected and everything is fine now, but after taking some measurements I decided to go ahead and buy the G5 console from them to use on my racing sim. 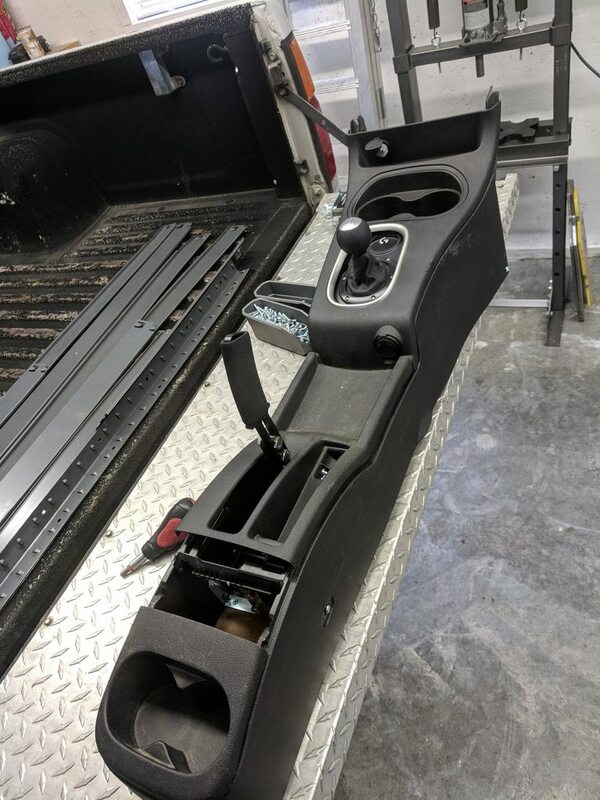 They gave me a very nice discount on it I had to trim it a little on the right side of the shifter hole so that the console would sit flat on the ground, and then had to trim some plastic out under the shifter hole itself to make the Logitec shifter fit under there. The e-brake I have fits nicely in the Pontiac's e-brake hole as well. 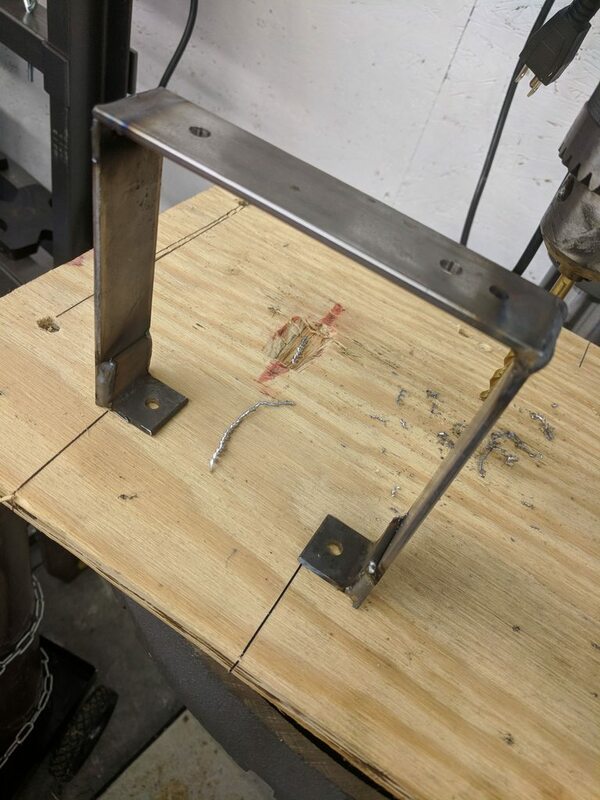 I had some thin flat bar left over from another project that I'm using to make the bracketry to mount the shifter to the base I'm going to make (out of 2x4). Here's a picture of the console next to the seat. I'm going to build up the base underneath the console to get it to sit up higher so it'll be in a position more like a real car. 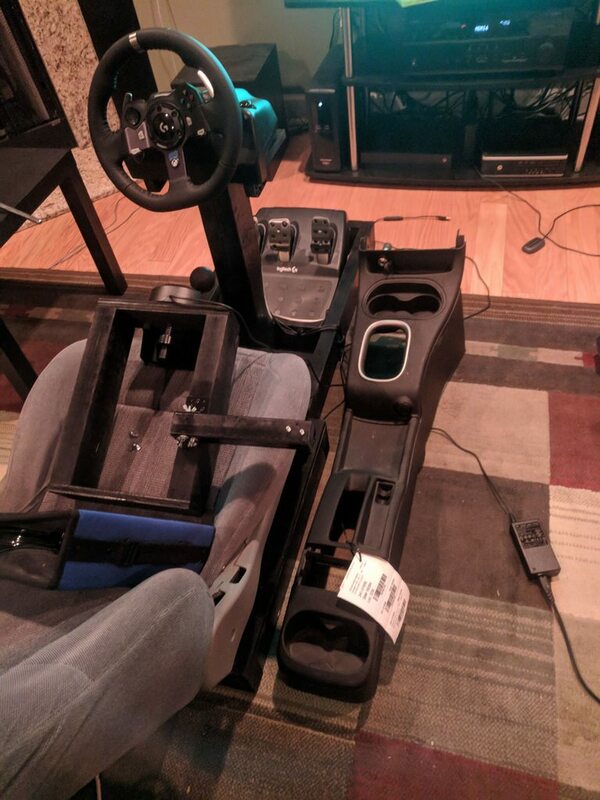 The wooden box sitting in the seat is my "quick and dirty" shifter holder I made over a year ago and never bothered to update lol. Your original pics from 2017 & Photobucket are gone, but I can see what you did in this latest post. I'll have to hunt down those original pics and re-up them. 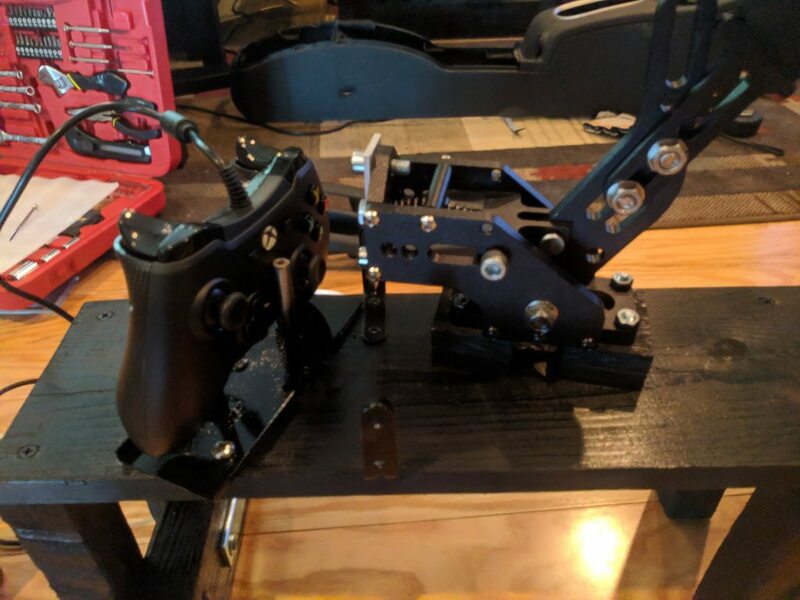 In another update, I built this metal stand for the shifter. Fits perfectly under the console. The metal bit has since been painted. I got sick for a week so I haven't been back in the garage to cut the plywood and whatnot to build the console's base box. Picked up lumber and whatnot to make the base yesterday. 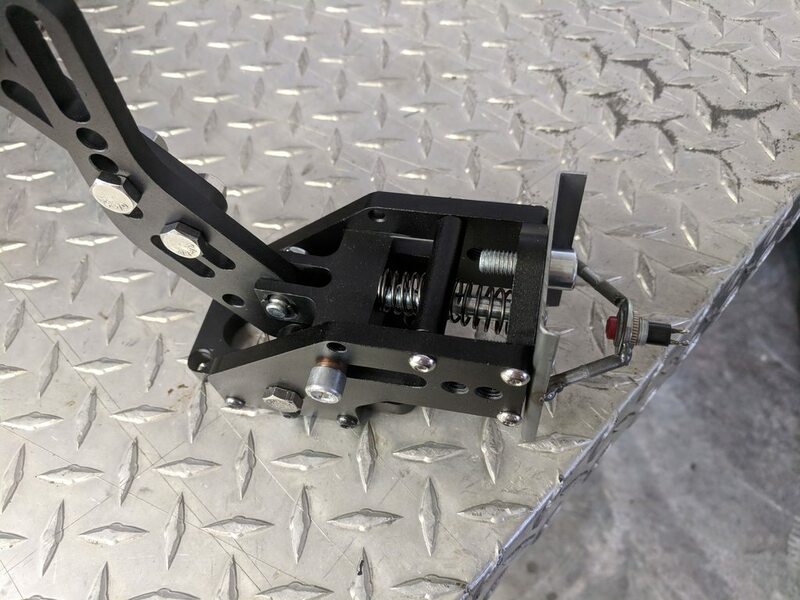 Removed the master cylinder from the handbrake I bought and made a blockoff plate with a piece of aluminum. Restored spring tension to the e-brake using a worn out recoil spring from an old Makarov (I knew there was a reason I never threw out old gun parts...). E-brake fits nicely in the factory hole. I'm going to raise it about an inch for final mounting to make it easier to get to. Got the e-brake mounted and the controller setup so that the e-brake pushes the "b" button (for handbrake). Making use of the Xbox One's "Co-pilot" accessibility feature that allows 2 controllers to be used simultaneously. Not one to give up, I took the wheel completely apart, removed all the "intelligent" bits with the buttons and such on them and routed them outside the wheel (I've not gotten a good mounting solution for this board yet) and then soldered leads to the board to add an external button. Ran wires from this down to the e-brake and welded up a bracket to hold the button in place. 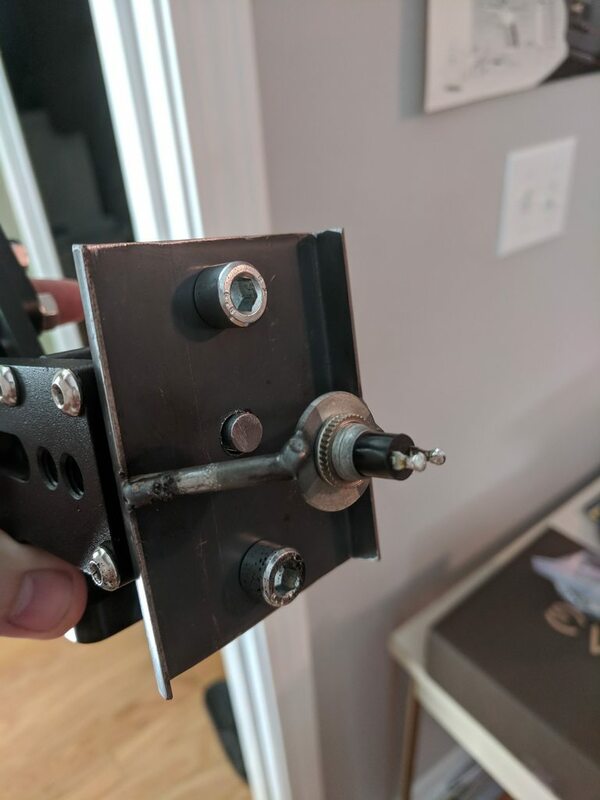 Had to modify the actuator rod (bolt) a bit to make it work but it does good. 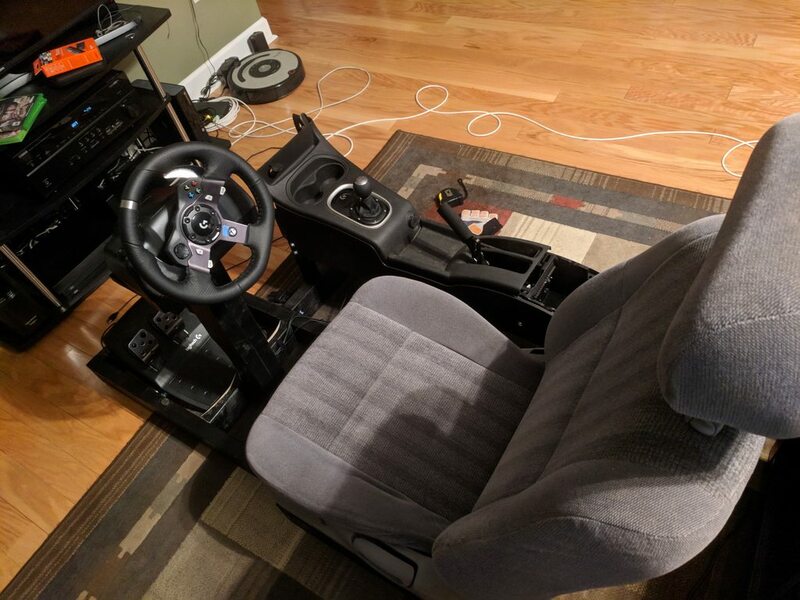 After testing, I've installed everything and gotten the center console mounted up to the main seat (it's still removable so they can be stored separately in the event I decide to put them away for a time). I need to adjust the pull on the brake a bit, right now it's a bit long, but I should be able to limit the travel without a lot of trouble. It is a HUGE improvement over having the e-brake button on the wheel where it moves around as you turn corners. Being able to just yank the handle and initiate a drift is so much better. I'm kinda surprised there's not more interest in something like this on here. I know a lot of you guys race your trucks. Having a good sim is a great way to get practice.